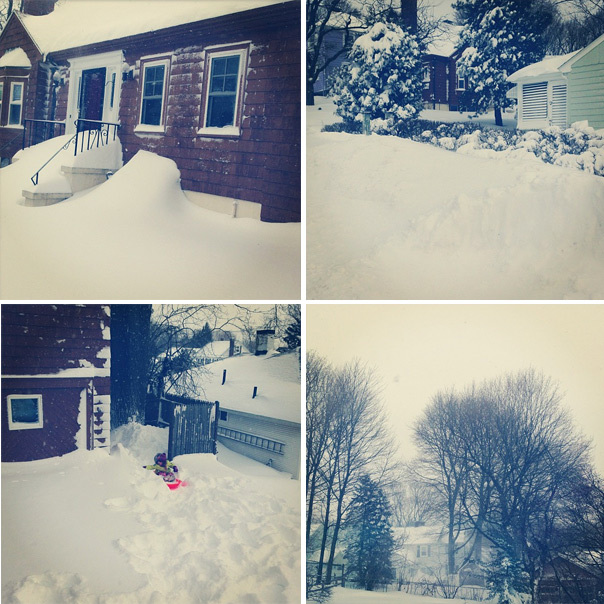 Blizzard in Boston, photos taken with my phone! I didn’t yet know what it was like to wake up to walls of snow blocking the doors. I didn’t yet know what it was like to live in a ghost town where cars were not allowed to drive after 4 PM on Friday. The wind blew strongly. The snow fell down steadily. They called it a blizzard. It was impressive. It was magical and everything they had predicted. -Make crêpes for breakfast since Lulu asked for them right away! -Take my snow shoes with her on the sled behind, and walk to the hill near our house–we were alone there! -Have a hot chocolate when we came back. -Make a large pot of hearty soup for lunch with vegetable galettes. -Bake desserts to keep us company–Lulu asked for the chocolate ones. -Read and play by the fire while Lulu zoomed through the house on her scooter. Oh how much I love that snow! This weekend will stay in our memory for a long time. I’m in MA too and I’m seeing a ton of snow. I just love it. We were clobbered on the Connecticut coast. Not use to having to digging ourselves out of our own homes. My first blizzard experience too! Thanks for this post. This weekend is imprinted on my memory and heart as well! Beautiful pictures! We’re in MA too and haven’t seen this much snow since I lived in Canada!! I found you blog today! I’m envious! Here in NZ it’s 23 degrees! Want to trade? Just kidding- love the summer’s here! So fun to see everyone’s snow photos. We lived in Albany when my kids were young. They LOVED the snow and so did I. Now we are down in Houston and even though it’s fall-like thru-out winter…we miss snow! Have fun! WOW!!! Amazing! I cannot even imagine what that would be like! I live in coastal North Island New Zealand – that would never happen. You made so beautiful photos. I love it. And I love snow. Today it’s also snowing here in Vienna. But there isn’t so much snow like at you. Voilà de créer de magnifiques souvenirs à votre petite Lulu ! J’imagine ses petits yeux pétillants en découvrant ces montagnes de neige. Et le plaisir de savourer un bon chocolat chaud, un bol de soupe, et de profiter de la lecture de son livre préféré au coin du feu, après des descentes en luge toute l’après-midi ! You make the blizzard sound like so much fun! I stayed put in southern Maine and also made soup. I’m intrigued however by vegetable galettes. Recipe??? I had neighbors over for dinner last night and made a huge pot of chili, cornbread, and brownies (with some mashed avocado in the batter). I love snowstorms! oh, i’m envious! looks so magical. i’ve been longing for snow, any snow, to fall here, so that huxley can know what it is outside of just a pretty, falling, white substance in the books he reads. enjoy, bea! There is something truly magical about a blizzard! they are massive and the day after is just beatiful and so quiet,loved it. But long winters ,no thanks, so i am happily living in Florida. The grass is always greener on the other side, right? Like you said, today is sunny and it’s truly beautiful! Then onto melting….. 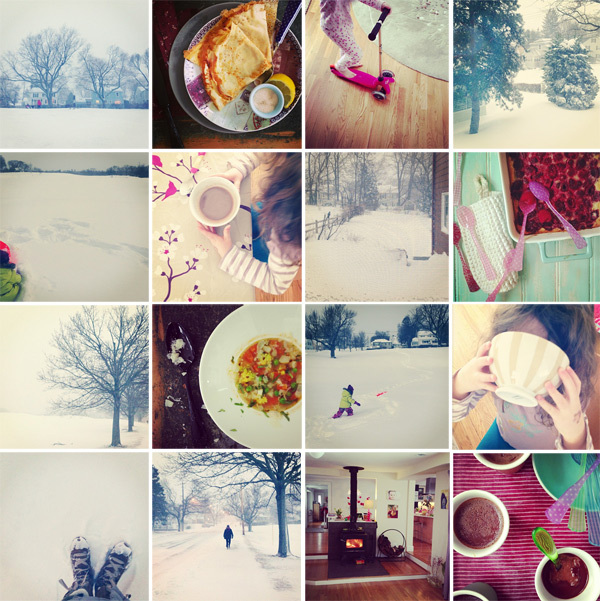 Thank you for the beautiful post and for not whining about the blizzard. It is winter and snow is not an abnormality. So sunny almost all the time here in Barcelona, we miss some snowy images like yours!! Looks perfect for a fun day out, especially when you have kids. Enjoy! – and stay warm! Hello! I’ve just discovered your blog after watching you and Josée on her show. Here, in Ottawa, we also got pummeled, except since we’re the winter capital of Canada, no such luck as a day off. We made it up on Sunday by going to Winterlude for tobogganing, luge and other winter wonders… hot chocolate, beavertails…. miam miam. Stay warm! What a fun day. I grew up in South Dakota and have experienced many blizzards and snow days. Now I live in Florida but I do miss the snow. You took advantage of the moment with your day. I really enjoy your blog and have recommended it on my blog, whatisinmyworld.com, as one of the blogs I am going to follow in 2013. Stay warm and I look forward to your next post. Thank you for the sensibility you bring to gluten-free food, that it should, above all, just be wonderful food that happens to not contain gluten. Most gluten-free recipes are neither delicious nor nutritious and yours are both. I have been so grateful. Do you happen to have a gluten-free sugar cookie recipe for Valentine’s Day? Thank you. I hope you and yours enjoy the fête. L’est de la France est aussi sous la neige (La Petite Pierre et peut être Albestroff?) mais pas tant que ça ! Profitez bien de ces moments magiques. Bonjour Lazaz, super j’espère que vous vous régalerez. Oui mes parents m’ont dit qu’en effet, il avait neigé. your little girl is so big now, i remember when i first came across your blog a few years ago she was just a baby. so precious. Just came across this one—lovely photos Béa. I usually go straight for the food posts, but it’s nice to see a local posting (and you have a fireplace!). I’m in Boston too, been reading your blog for ages—and I recently found out that you know my good friend Emily (her son is Malcolm). Also – I’m a food magazine art director (we must get in touch)! This is a small world indeed! Would love to meet! I was just emailed with Emily with this AM as we returned from her home country and we love to chat about it too! Thanks des monceaux à l’auteur!